Not content with the barrage of new goodies unleashed on the public at Tuesday’s media event, Apple has also released new updates to its professional suite of filmmaking applications: Final Cut Pro X, Motion, and Compressor. Version 10.0.6 is Final Cut Pro X's most significant update yet: The program now supports the RED camera line, adding both native Redcode Raw editing and transcoding to Apple’s ProRes format. The update also adds new multichannel audio editing tools to the timeline, dual viewers (allowing editors to compare shots on the fly), support for MXF plug-ins, a unified import window for both file-based camera systems and folders, and support for chapter markers. 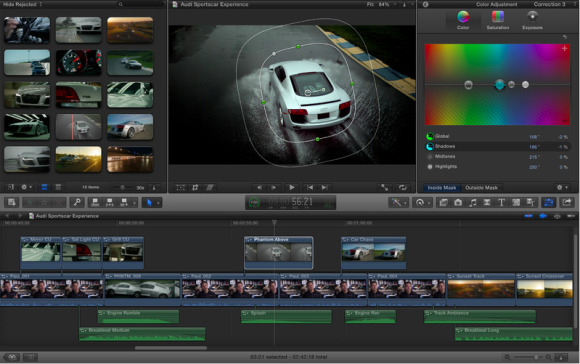 Additionally, the new version lets editors keep Connected Clips in place while slipping, sliding, or moving clips, add freeze-frames more easily, copy and paste attributes with a new Paste window, use new audio controls for Multicam clips, create multiple range selections for a single clip, and export projects and range selections more easily via a redesigned Share interface. FCP’s XML has also been updated to version 1.2, allowing editors to import and export metadata to third-party apps. Compressor and Motion also get a few updates to call their own. Apple has improved the cluster setup for Compressor, along with eliminating the re-authentication process for additional encoding clusters and addressing an issue related to third-party QuickTime components. Motion receives improved anti-aliasing for text, the ability to open multiple projects simultaneously, and faster project loading times. The updates are free for current users; new users can pick up the apps for $300 (Final Cut Pro X) and $50 each (Motion or Compressor).